The Gourmet Chip Company hits it out of the park when it comes to being in Asheville. It knows its target demographic perfectly. It knows it’s in Asheville. It knows words like Gourmet, when paired with something previously considered low, like chips, is always a hit. It knows that Asheville likes to simultaneously be wealthy, while being perceived as rustic, downhome, and fun. It knows that Asheville likes to be perceived as progressive and tolerant, while also being one of the most rapidly gentrifying cities in America – https://www.citizen-times.com/story/news/local/2017/01/24/asheville-gentrification-pace-makes-top-10-list/96992182/. In this way, The Gourmet Chip Company is spot on. And I can’t fault them for that. But then there are the chips. Let’s talk about potato chips and what they are. They’re pretty plain; thinly sliced chips of a plain potato, deep fried, and typically sprinkled with salt. That’s it. It’s a pretty interesting snack to devote a restaurant too. 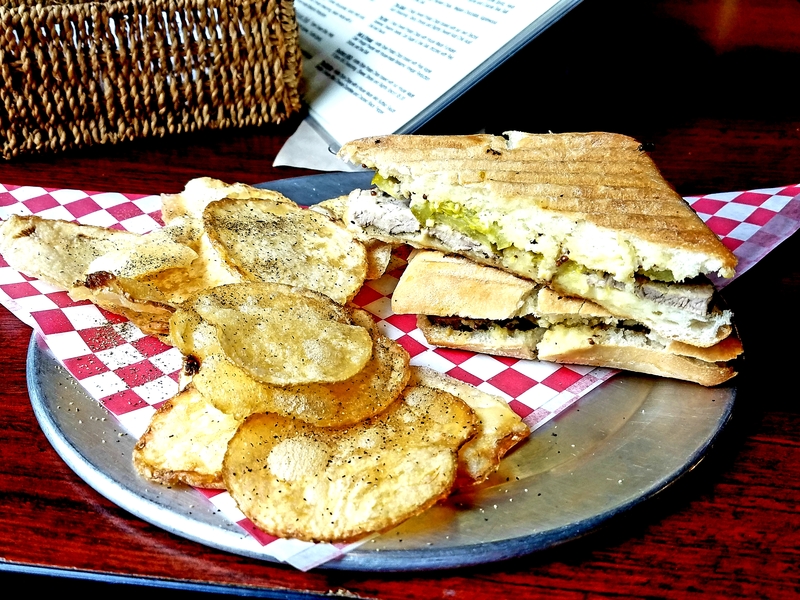 Obviously they have many sandwich options, and I ordered the Cuban Sandwich on this day, but their main focus – their calling card – are the chips. How creative do you want to be with potato chips? Well, based on a walk down your typical grocery story chip aisle, extremely creative, with all kinds of flavor combinations. But that’s not really The Gourmet Chip Company. Those grocery store bags of chips have probably been in their vacuum sealed bags for weeks, if not months, only after being sprayed with chemicals and artificial flavoring. The Gourmet Chip Company isn’t interested in that, however. They’re not interested in providing you with the most outrageous flavors. They, I assume, want to provide you with the best chip. Right? Gourmet. Right? So their basic salt & pepper potato chip should be better than any plain chip you get from a freshly torn open bag of Ruffles, right? Why have a Lays potato chip that’s been sitting in a bag for a month, when you can have a freshly made gourmet potato chip? Well, if you can tell the difference between one of their salt & pepper gourmet potato chips and a Lays potato chip, you are a better person than me. I cannot. They were slightly thicker and less greasy than your typical bagged potato chip, and there was a pleasant chewiness that you don’t get with your stale chips. But there was also nothing remarkable; nothing that made me think “gourmet” or “worth the money”. They were potato chips, just like any other potato chips. If you go to Jimmy Johns, order a sub with a bag of potato chips, you’re getting the same taste experience. What you’re missing is the Asheville flair – the word gourmet, their rustic bags, and the art of convincing yourself that you are experiencing something better, when you are not. Then there was the sandwich. I have Cuban Sandwiches pretty regularly, all over the state, so I take them pretty seriously (although, I’ll admit here that I’ve never had a Cubano in Miami! I know. I have to. I will). The Gourmet Chip Company’s Cuban Sandwich includes plantains, which I asked them to hold, along with the cheese. Their Cuban Sandwich was perfectly fine. Other than the bread being slightly soggy, without the outer crispiness you look for, it was fine. In other words, all of the necessary ingredients for a Cuban Sandwich were there. And the correct taste was there. And shouldn’t that be enough? The thing about sandwiches is, if you provide someone with the ingredients, they should be able to make a pretty great version of that sandwich. It’s not like there’s a high level of artistry when it comes to staple sandwiches. But the Cuban Sandwich is different, because it is so great. It should be more than just the sum of its parts, and most of the time, when you find a good one, it is more. The Cuban Sandwich at The Gourmet Chip shop was fine, but if I took the ingredients to a normal deli and asked them to slap together those ingredients between two toasted slices of bread, that sandwich would have been just as good as the one I got from The Gourmet Chip Company. There was nothing special about it that made it stand out. There was nothing soulful. There was nothing authentic. Just like their chips, just like the city of Asheville, their Cuban was solid. It had the right ingredients. It was edible. It was…fine. The Gourmet Chip Company has the right name – gourmet. It has the right quirkiness – chips. And it has the right location – Asheville. But like Asheville, the quality doesn’t match the persona.